Angry Birds – The popular game is a quick addiction and a great way to pass the time while knocking down the pigs. Angry Birds Space – The latest game in the Angry Birds franchise not only looks great on the Galaxy Note, but it has levels that are exclusive to the Note. Astro File Manager – An easy way to view the file and directory contents of the Note. Comixology – The 5.3″ screen is the perfect place to view digital comic books, and Comixology is the best comic book reading platform. Draw Something – The hottest game right now is even better with a bigger screen and the Galaxy Note’s included stylus, allowing you to outdraw all your friends. DroidLight – For those times when you really need a flashlight, instead of using the screen to illuminate, use this app to turn on the LED flash on the back of the Samsung Galaxy Note. Netflix – Watch all the streaming movies and television programs with your Netflix streaming account. Spotify – An extensive library of music at your fingertips, available for streaming any time and any place. 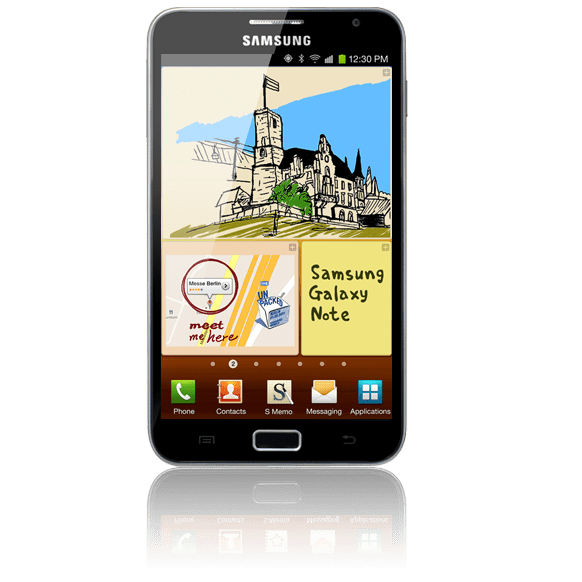 Android phones just keep getting better and better, and the Samsung Galaxy Note is no exception. The larger screen, fast data, and dual core processor are the best platform for using all your apps.